1. Travel cases and frames to protect fine art objects that must withstand the additional rigors of long distance and international transporting. 2. Museum crates for all encasing delicate art objects, including antiques of all shapes and sizes. 3. 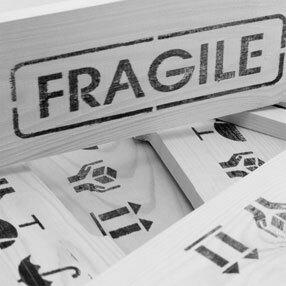 Standard crates, such as corrugated boxes, object trays, and foam board cases, for protecting less fragile objects. 4. Skids made in both metals and timber for securely cradling large sculptures and other similar objects. 5. Skeleton or slat crates for large art pieces with particularly unusual configurations that require less stringent protection. 6. Hand-сarry сases for small fine art objects. 7. Containers in paper or plastic, as well as soft wrapping with archival and standard materials. 8. Custom crates matching your personal wishes. When packing any valuable or fragile item, our trained art handling specialists always wear white, cotton gloves that prevent dirt and unwanted finger prints from getting on the object. We never use any packaging materials that contain acid and can drastically change the valuable object. In addition, our team works only in the clean, isolated packaging area. Furthermore, each package or box is labeled in order to reduce confusion during art delivery. In general, being a reliable shipping company, Fine Art Shippers offer a great variety of art services, including packing and crating, art storage, door-to-door delivery with special handling for the most valuable or irreplaceable items, local and long-distance transporting, insurance, and many others. That’s why you can be confident in the safety of your precious artwork!